Richard Russell's "final descent to the ground was intentional," federal investigators said in a news release on Friday ending their months of investigation. The FBI will not be pursuing federal charges. His motive remains a mystery, the bureau concluded. Pierce County Medical Examiner’s Office has officially ruled Russell’s death a suicide. Horizon is “working with our industry partners, governmental authorities and other subject matter experts to review pertinent safety protocols, and determine where there may be opportunities to make enhancements as we move forward,” Beck’s statement said. The findings released Friday also detailed a timeline describing how Russell’s unauthorized flight unfolded the evening of Aug. 10. Russell, a married 29-year-old Alaska transplant who lived in Sumner, arrived for work about 2:36 p.m., and cleared security checkpoints without any anomalies, the timeline said. 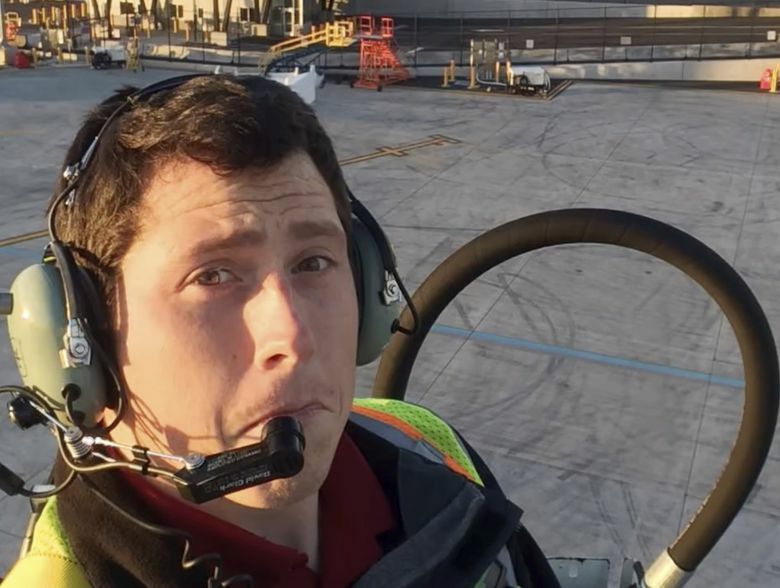 At 7:15 p.m., he arrived in a tow vehicle to the cargo area at the far north end of Sea-Tac’s airfield and climbed aboard Horizon Air Q400 four minutes later. Russell began the “sequence to start aircraft,” at 7:22 p.m., causing its propellers to start turning. Over the next few minutes, Russell exited the plane and used the tow vehicle to turn its nose toward the airfield. He then pulled it away from its parked location at 7:32 p.m., with the aircraft taking off one minute later. 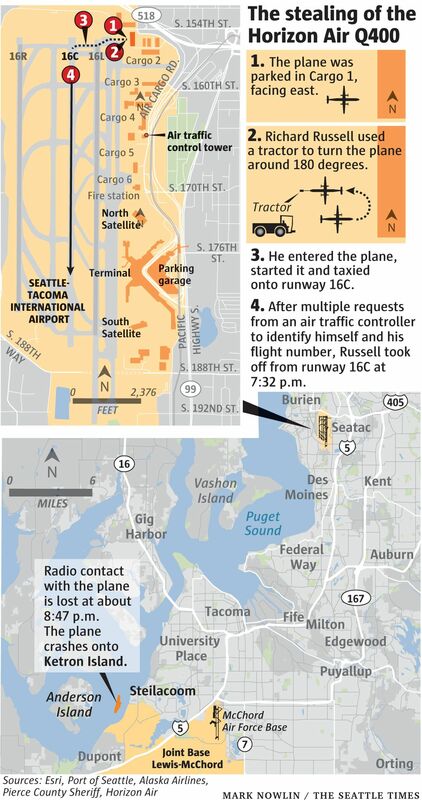 For the next hour and 13 minutes, Russell piloted the plane, at times pulling off several aerobatic stunts during the unauthorized flight, before crashing into the woods on the island in South Puget Sound at 8:46 p.m.
During a rambling, recorded conversation with ground control during the flight, Russell described himself as a “man in crisis,” but also calmly chatted about Mount Rainier’s beauty and how to find an orca that for days had garnered national attention while carrying its dead calf in Puget Sound. The flight shut down airport traffic, prompted two F-15 fighter jets in Portland to break the sound barrier while scrambling to the scene and drew dozens of witnesses to call 911. It also left pilots and other aviation experts speculating as to how Russell, a low-paid ground-services employee with no apparent pilot experience, knew how to fly the 76-seat passenger turboprop plane and pull off the aerial maneuvers. The investigation didn’t find that Russell had received any formal flight training. Described by friends as a quiet, friendly jokester, Russell worked for Horizon for nearly four years as a ground agent who handled baggage and tidied and de-iced planes. At times, he shared complaints with colleagues about their grueling work and low pay. Instead, “the column remained in a position forward of neutral and moved further forward about six seconds prior” to the flight-data recording ending at the time of the crash, investigators found. The aircraft’s cockpit voice recorder “did not capture any significant sounds” beyond Russell’s discussion with ground-control personnel, the FBI added Friday. Shortly after the incident, Joel Monteith, a SkyWest Airlines pilot, called 911 to report that he previously encountered Russell with another baggage handler “pointing and flipping switches” inside an empty jet at the airport about a year earlier.